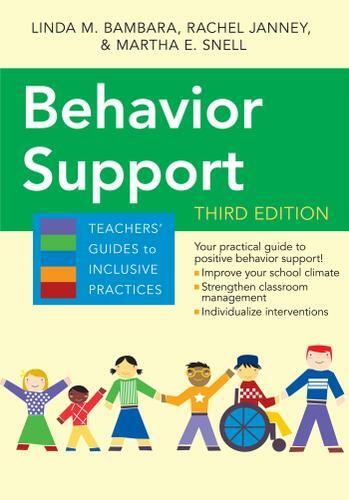 The revised and expanded edition of a popular book trusted in classrooms across the country, Behavior Support is your guide to implementing effective positive behavior support (PBS)—both in the classroom and across an entire school. You'll get explicit, research-based strategies for implementing the three tiers of PBS: universal, school-wide interventions; selected interventions with students exhibiting risk behaviors; and specialized interventions with students who need intensive, individualized help. WHAT'S NEW: More research and strategies on key topics, including bullying prevention, safe and responsive school climates, functional assessment, and individual student interventions. You'll also get more explicit step-by-step instructions, new case examples, tips on sustaining PBS in your school, redesigned forms that are practical and easy to use, and focusing questions for each chapter that highlight key takeaways. This revised and expanded edition is your guide to implementing effective positive behavior support. Includes more on bullying prevention, safe and responsive school climates, and functional behavior analysis.